Does lower trading volumes for U.S. stocks indicate a lack of confidence in the market, even as stock prices march higher and the Dow Jones Industrial Average (DJIA) cracks 17,000? Average daily trading volume, tallied by month, was just 5.8 billion shares in May, less than half of the peak of 12.3 billion shares during the financial crisis. Here’s one possible reason why trading volume is down: High-frequency traders remain a huge force, but they’re not powering turnover quite as much as they used to. This type of trading, which relies on getting information and prices microseconds faster than the next trader, now accounts for 48.5% of overall U.S. stock-market volume, down from 61% in 2009, according to estimates from Tabb Group, a research and advisory firm. High-frequency trading .added volume when there was more volatility in the market, but as volatility decreased and stabilized, HFT also decreased. Certain HFT strategies that thrive on volatility just aren’t as active today, as a key gauge of volatility touches a seven-year low . More money is being invested in index funds, which only infrequently change the make-up of their holdings, rather than through active funds or brokers incentivized to buy and sell individual stocks frequently. 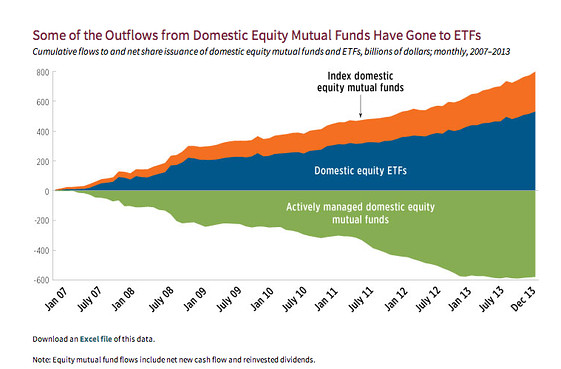 This chart shows how much money is flooding into investment vehicles — index mutual funds and exchange-traded funds — that track stock indexes. These two types of funds have grabbed about 24% of the U.S. mutual fund and ETF market, down from less than 5% in 1998, according to Deutsche Bank data. 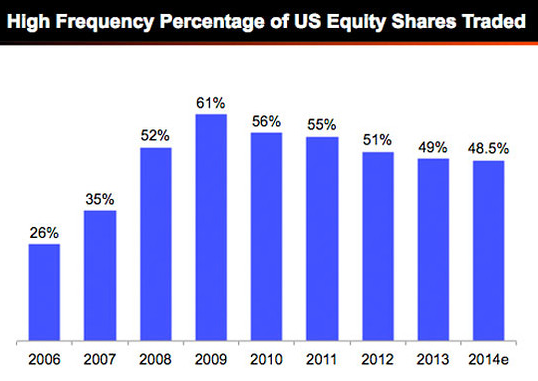 While trading in stocks has steadily declined, the opposite has happened with equity futures and options. Ryan Detrick, a technical analyst who writes at the trading website SeeItMarket.com, says volumes are not as much as falling as they are shifting. 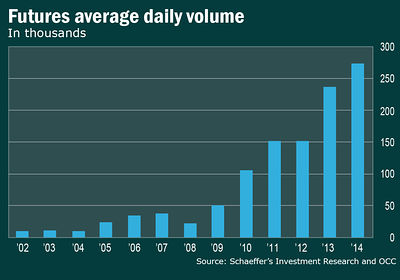 Average daily volume in futures this year is up 15% from 2013 and has jumped ninefold since 2007. “Since the big retail exodus form equity markets, the investors that are still trading are much more sophisticated,” he said. “They know that they can control money far more efficiently by buying futures or options and leverage their positions with less capital. 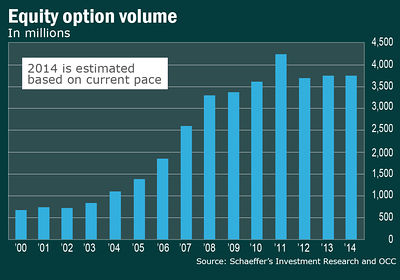 Individual investors now account for 24% of listed options trading, according to Tabb Group. 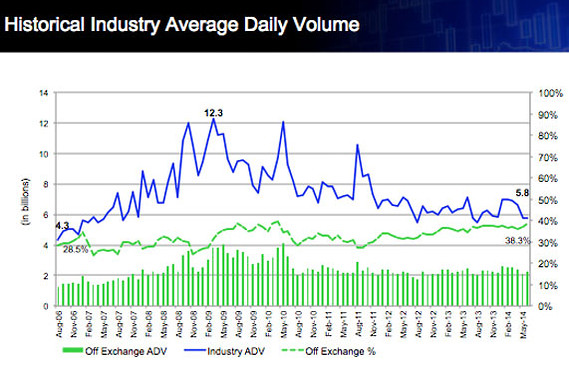 The average daily trading volume of options contracts by retail investors increased 12% last year to 3.9 million contracts, outpacing the overall options market growth of 2.7%. One reason why the CBOE VIX index — the “fear” gauge — has been so low in the past 18 months is because investors have piled into VIX calls as a hedge against falling markets. Brokerage firms such as Charles Schwab Corp. (SCHW) and TD Ameritrade Holding Corp. (AMTD) promote the use of derivatives through educational materials for retail investors, who also can tap a plethora of free online content. Big investment banks have reduced their trading activity in anticipation of the so-called Volker Rule, a section of the Dodd-Frank regulation that restricts banks from proprietary and speculative trading. Once major players in the commodities, foreign exchange, fixed-income and equities markets, banks have pulled back to an extent. Overall trading revenue at those firms fell 18% in the first quarter from the same period in 2013, according to the Office of the Comptroller of the Currency (OCC). 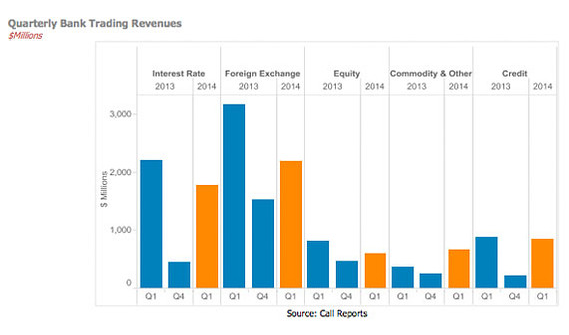 Equity trading revenue has slumped 27%, and revenue from trading interest-rate products is down 20%. “The extended period of both low interest rates and low volatility has weakened client demand for risk management transactions,” said Kurt Wilhelm, director of the OCC’s financial markets group.